Women's S (L) - shown in size large. Most frequently asked question: In the first wave pattern, where do the stitches for row 2 come from? The first wave pattern straddles the start of round; you’ll work back and forth in short rows with half your stitches on one side of the start of round, and half on the other. With so many wonderful dyers in our midst, I find myself spinning many painted rovings, winding vibrant colors onto my drop spindles. 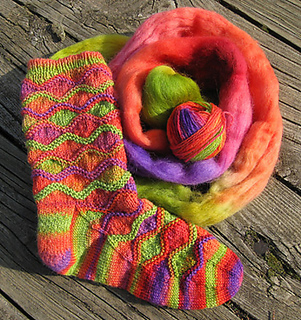 Navajo-plied for strength and for boldness of color, the spun rovings make wonderful striped sock yarn. Eventually I tire of stripes, but because I love the plying, I seek ways to divert the stripes into something more random, something surprising. 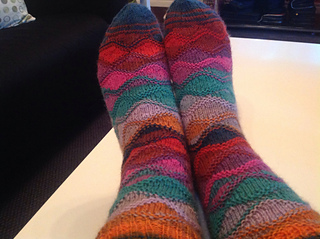 These socks are the cure for stripe boredom. The shifting colors in the yarn undulate into waves that curve like drifting autumn leaves, or distant hills at sunset. 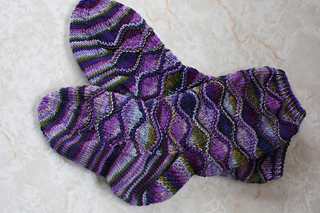 For definition and relief (both visual and mental), the waves are separated by ridges of garter stitch. Knitters who challenge themselves to learn backward knitting will speed through the pattern’s many short rows. The leg width is dependent upon the number of pattern repeats, but is stretchy and forgiving. 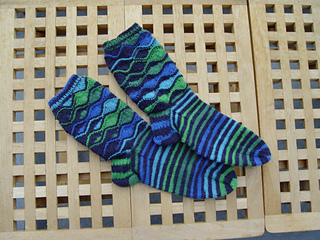 The shifting pattern repeat means these socks are best knit on double-pointed needles. Length heel to toe: adjustable by pattern repeat. Sock shown size large, 9 inches around at leg, 8 inches around at foot, and foot is 10.25 inches long; 6.5 wave rounds from start of gusset to beginning of toe.